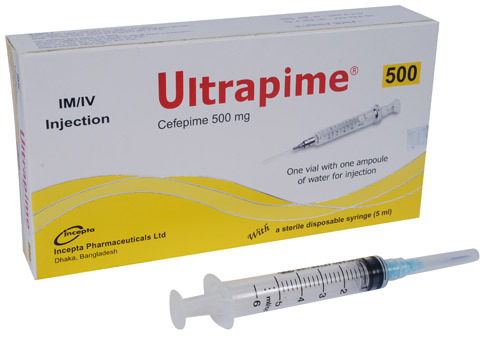 Ultrapime 500 IM/IV Injection : Each vial contains Cefepime 500 mg as Cefepime Hydrochloride USP with L-Arginine sterile powder. Ultrapime 1 gm IM/IV Injection : Each vial contains Cefepime 1 gm as Cefepime Hydrochloride USP with L-Arginine sterile powder. 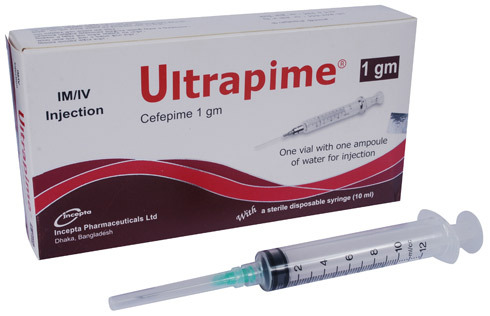 Ultrapime Injection is a preparation of Cefepime. It is a fourth generation broad-spectrum cephalosporin antibiotic. Cefepime acts by inhibition of bacterial cell wall synthesis. It is highly resistant to hydrolysis by most beta-lactamases and exhibits rapid penetration into gram-negative bacterial cells. Staphylococcus aureus, Streptococcus pneumoniae, Streptococcus pyogenes, Viridans group streptococci, Staphylococcus epidermidis, Staphylococcus saprophyticus, Staphylococcus hominis, Streptococcus agalactiae. Enterobacter, Escherichia coli, Klebsiella pneumoniae, Proteus mirabilis, Pseudomonas aeruginosa, Acinetobacter calcoaceticus, Citrobacter diversus, Citrobacter freundii, Enterobacter spp., Haemophilus influenzae (including beta-lactamase producing strains), Haemophilus parainfluenzae, Hafnia alvei, Klebsiella oxytoca, Moraxella catarrhalis (including beta-lactamase producing strains), Morganella morganii, Proteus vulgaris, Providencia rettgeri, Providencia stuartii, Serratia marcescens, Neisseria meningitidis. • Empiric Therapy for Febrile Neutropenic Patients. Impaired Hepatic Function - No adjustment is necessary for patients with impaired hepatic function. These solutions may be stored up to 24 hours at room temperature or 7 days in a refrigerator. Ultrapime Injection is compatible at concentrations between 1 and 40 mg/ml with the following IV infusion fluids: (1) 0.9% Sodium chloride, (2) 5% and 10% Dextrose. Generally Cefepime is well tolerated. However, few side-effects including rash, pruritus, urticaria, fever, headache, nausea, vomiting, diarrhea, dizziness, oral moniliasis may occur. In patients with impaired renal function (creatinine clearance <60 ml/min), the dose of Cefepime should be adjusted. Cefepime should be prescribed with caution in individuals with a history of gastrointestinal diseases, particularly colitis. Pregnancy: There are no adequate and well-controlled studies of Cefepime use in pregnant women. Cefepime should be used during pregnancy only if clearly needed. Lactation: Cefepime is excreted in human breast milk in very low concentrations. Caution should be exercised when Cefepime is administered to a nursing woman.